This easy slip on by Rock Spring is your go to shoe to wear around town! The Addictionâ„¢ Walker hold up to its name by delivering durability, cushioning with energy-returning MoGo midsoles, full-grain leather upper, and reliable slip-resistant outsole. Making this this addictive shoe great for work, to the road, or walking the track. This shoe will provide sturdy support mile after mile by supporting low arches and keeping pronation under control. 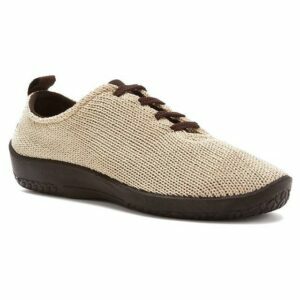 The Arcopedico LS Beige is a high-quality anatomically-designed women's comfort shoe that is hand-made in Portugal. Tractioned rubber sole grounds a beach-ready flip-flop constructed with a water-resistant strap and quick-dry lining. The Vionic Bella ll Black is a comfortable flip flop sandal adorned with a cute little bow that is trimmed with the Vionic "V" logo.